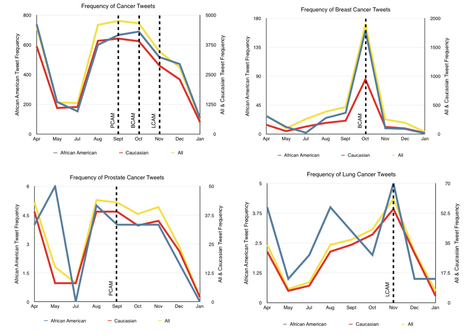 The findings of the study provide evidence that social media can serve as a very powerful and important tool in implementing and disseminating critical prevention, screening, and treatment messages to the community in real-time. The study also introduced and tested a new methodology of identifying race and ethnicity among users of the social media. Study findings highlight the potential benefits of social media as a tool in reducing racial and ethnic disparities. More details about this study here. 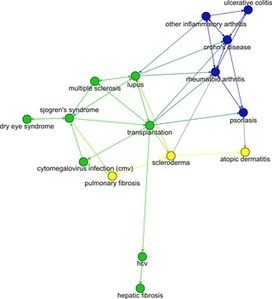 When a drug starts to show signs of success with a particular disease, additional diseases are sought to broaden the drug’s therapeutic and commercial appeal. Once a drug has been approved by regulatory agencies, its use may not be restricted to the diseases for which it was approved, as medical practitioners may prescribe it off-label. Indeed, a drug’s efficacy against certain diseases may only become fully apparent once it is consumed by a large number of patients or made widely available for scientific experimentation. New findings about a drug’s efficacy can prompt the original drug developer to seek supplemental indication approvals or pursue life-cycle management strategies such as combining the drug with other new or existing drugs. The unsuspected therapeutic potential of a drug is illustrated most clearly by the field of drug repurposing. Drug repurposing has drawn attention in part due to the commercial interest of pharmaceutical companies possessing an abundance of safe drugs that have failed to show sufficient efficacy in any disease. FDA to Device Makers: Want Faster Approval? Pay Up! 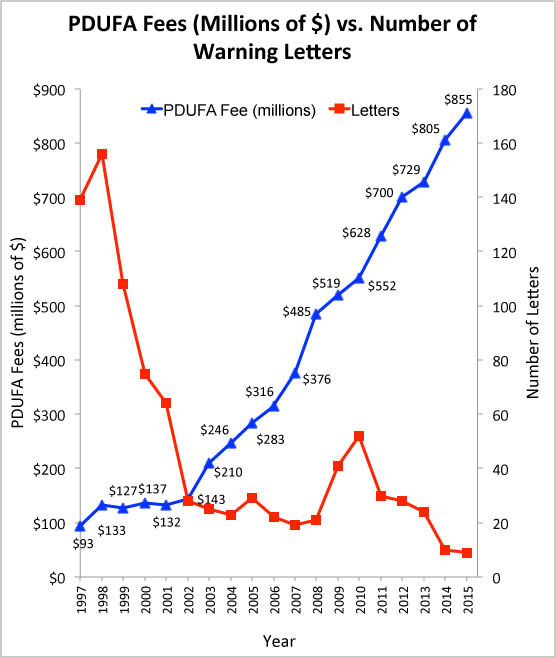 Every five years, Congress must decide whether or not to re-approve the Prescription Drug User Fee Act (PDUFA), which allows the FDA to charge drug companies millions of dollars for agreeing to review new drug applications (NDI). It is essentially a “pay for play” system where the FDA gives preference to those who play, even if the drugs or devices they have to offer are neither safe nor effective. 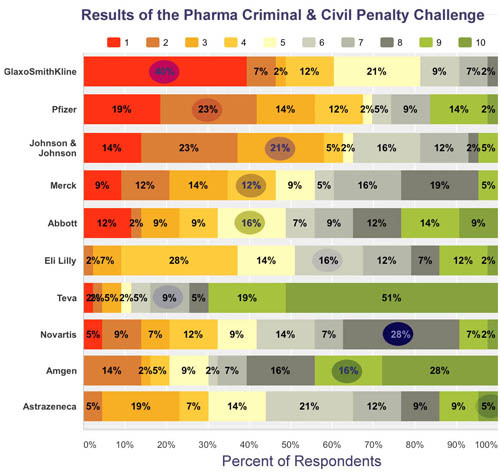 Only 1 Person Correctly Ranked All Companies in The Pharma Criminal & Civil Penalty Challenge! Public Citizen released additional data on pharmaceutical industry criminal and civil settlements, stemming from its March report tallying all settlements with both federal and state governments from 1991 through 2015. The new data provide company-specific totals for the most recent 10-year period (2006-2015). The Challenge: Can you rank the Top 10 of those companies in terms of the amount paid over those 10 years? Forty-three brave souls took the challenge. Only one person was able to put all the companies in the correct order. There were a few other surprises. Find out more about the results here. 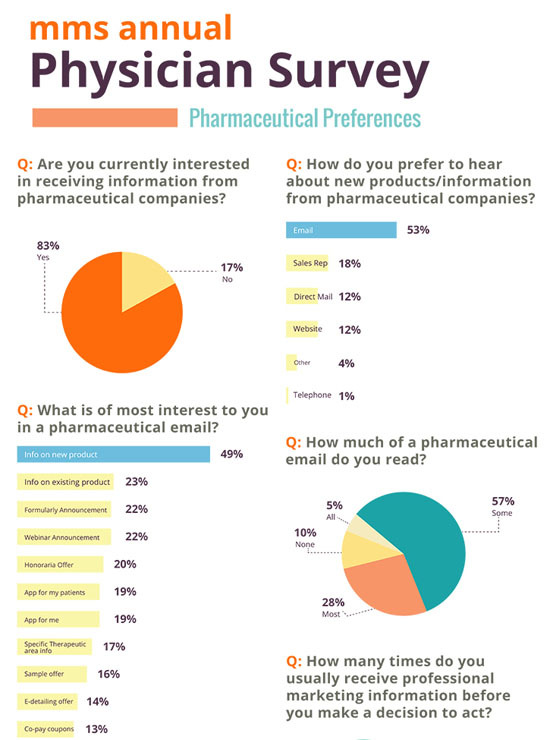 Physicians Want Pharma Info, But Mostly Via Email That Can Be Ignored Better Than Reps! In mms’ 2016 Physician Pharmaceutical Survey, doctors were asked specifically about their opinions and behaviors related to pharmaceutical marketing activities. See the full infographic/survey results here. Previous articleAre Pharma Marketers the “Voice” of the Patient?